A bad year for IBM just got even worse. 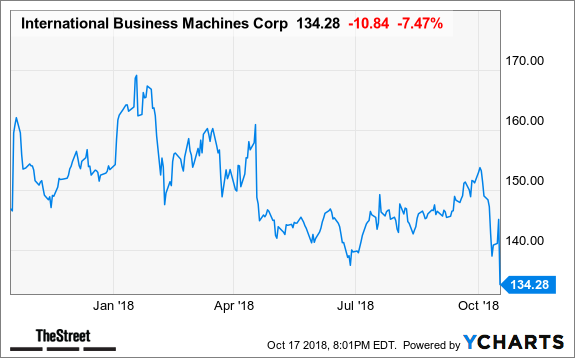 A bad year for International Business Machines Corporation (IBM just got even worse. After the information technology reported disappointing third-quarter earnings report Tuesday, the stock tanked. IBM shares ended Wednesday down 7.62% at $134.05. Sales declined 2.1% year-over-year to $18.8 billion, missing estimates of $19.1 billion, which still represents a decline. Earnings came in at $3.42 per share, actually beating estimates of $3.40. But it's the sales number the market was keying in on. IBM's systems division saw a sales decline of 6% year-over-year, to $4.15 billion. Its cloud business, which has been losing to Microsoft Corporation's (MSFT cloud business and Amazon.com Inc.'s (AMZN Amazon Web Services, saw sales decline 2% to $8.3 billion. TheStreet's tech columnist Eric Jhonsa says IBM shares don't have a bright outlook if it doesn't get sales moving again. IBM has struggled not only this year -- down 13% -- but in the past several years as well. IBM is down almost 23% in the past five years. MSFT and AMZN are holdings in Jim Cramer's Action Alerts PLUS member club. Want to be alerted before Jim Cramer buys or sells MSFT or AMZN? Learn more now.